Ma'iingan the Wolf plays an unique and meaningful, spiritual role among the Ojibweg, Bodéwadmig and Mamaceqta (Menominee) Anishinaabeg as a clan animal. Members of the wolf clan are known as warriors and as educators and defenders of important spiritual values. It is said that Wolves know where mashkiki, or medicine used for healing the sick, can be found. The Elders tell us that when you pray and ask for medicine the wolves will howl and you will know where the medicine can be found. Wolf Clan members are the defenders, hunters, scouts, loners, thinkers, and decision makers of the Nation. Wolf clan people particularly stand for virtues like perseverance and guardianship. Among the Anishinaabeg, perseverance, guardianship, self confidence, humility, and modesty are the traits wolves are most known for. Among the Haudenosaunee, who also have Wolf Clans, wolves are loved and respected for their loyalty, curiosity, patience, and their social skills. Wolves are friendly toward each other and, like most of us, devoted to only one mate. They live in organized packs just like humans. They are social and intelligent creatures and as such our elder brothers who teach us how to walk through life. 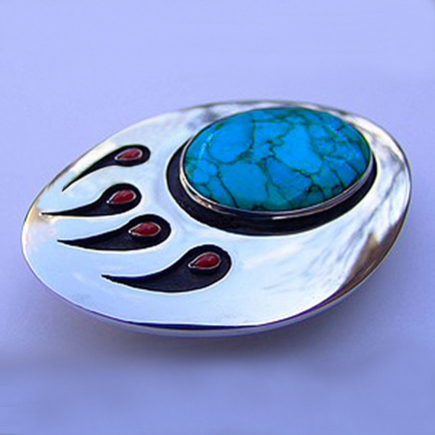 The above belt buckle, a stylized wolf paw, is executed in sterling silver and set with a hand-cut, oval blue turquoise stone and four red coral cabochons - each mounted in oxidized shadowbox settings. The silver of the buckle, the black of the shadowbox settings, and the blue of the turquoise stone stand for the clan colors of the Wolf - silver, black, and turquoise. The red of the corals of the four "toes" of the wolf paw, in conclusion, symbolizes the blood of many generations of brave Wolf Clan members whose blood was spilled throughout history as they were defending the lives and the culture of their People against the invasion by foreign Nations - Native and non-Native alike.